We are open monday-friday 8:00 AM-6:00 PM. How can we help you? In Poland are we deliver via Polish Post and courier post services. In case you choose courier post services delivery time will be maximum two working days (usually package arrives the next day). Packages send by Polish Post services are delivered within 3-5 days. We kindly ask you to give your cell phones numbers which help couriers to work efficiently (they often call customers to schedule the delivery time) and for us it´s helpful to react quickly in case of emergency. International shipments we conduct via courier post services. Delivery time: 2-7 days working days depends on the country of destination. International shipments are currently available only for registered customers. Register now! Domestic delivery cost of the packages send via Polish Post services is 12 zl and via courier post services is 20 zl. All orders of value above 300 zl are delivered free of charge in Poland area. International delivery cost depends on the country of destination. Every time you finalize your order you can choose the requested destination country. After you choose the country the information with the delivery cost will appear. Also, you will be given an up-dated information about the minimum order that will get you free delivery to the requested country of destination. International shipments are currently available only for registered customers. Register now! Example: delivery cost to Great Britain is 120 zl, delivery time 3-4 working days, free delivery for orders above 1500 zl. 1. Cash on delivery – payment given to courier or postman, currnetly available only for registered customers for the packages delivered in Poland area. Orders with this payment option are send immediately after the placement. 2. Money transfer (pre-payment) – customer makes money transfer on account of Shop. Transfer data (account number, amount, title) are send by e-mail confirming customer´s order. This kind of payment is usually booked on Shop account the next day. 3. Dotpay (payment via dotpay.pl online service) – all major types of credit cards, e-transfers from majority of Polish banks and other forms are accepted. The payment made via dotpay.pl is usually conducted within few minutes. In case of unusual form or amount of payment we generate the link to dotpay.pl online service which is send to the customer and allows the payment in different currencies, surcharges for order changes, etc. 4. PayPal (payment via PayPal online service) – it allows to conduct the payment practically from every place in the world using plenty forms of payment. You have to be registered in paypal.pl. Payments made via PayPal.pl are usually conducted within few minutes. In case you identified non-compliance of the received goods with your order or you identified defects in received goods, please contact us on e-mail shop@bandi.pl We will immediately contact you in order to determine the way to fix or compensate your harm. If you decide, for any reasons, to cancel your order, you should send back purchased products in undisturb packaging within 30 days from the order date. During the registration of your account and (alternatively) during the finalizing your order, you can choose the country of the shipment destiantion. On the list there are countries that have standarized, flat delivery cost (it will appear during the finalizing of your order). In case the delivery to country that is not on the list, please choose „Other” and we will contact you to determine all details of the shipment and payment. Taking and completion of the orders is conducted based on the Shop regulations, which is available here. 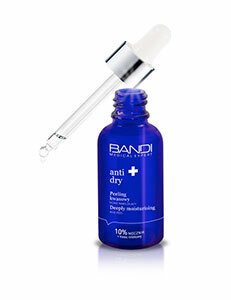 We care for your www.bandi-cosmetics.eu shopping safety. If you decide, for any reasons, to cancel your order, you should send back purchased products in undisturb packaging within 30 days from the order date. Personal data are processed to accomplish this order according to shopping regulations as well as for other purposes connected with Shop´s activity, including purposes of promotion and advertisement of the products and services according to Art. 23 § 1 and 2 of Act from 29 august 1997 about personal data protection (Dz.U. Nr.133 poz.883 z późn. zm.). Personal data is not shared with other subjects for marketing purposes.